4. 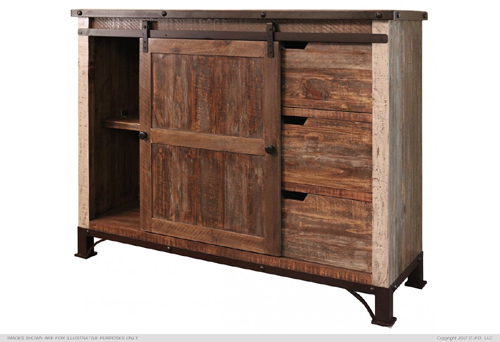 Barn doors glide to the sides to reveal storage space with hanging rod. 5. Armoire features large mirror on door, open to reveal hanging rod. Shelves behind slinding wood door are fixed. Two deep bottom drawers for extra storage. 6. Multi-functional Chest includes three deep drawers and one shelf behind sliding door. 8. Drawers on all pieces feature ball-bearing metal glides and English dovetail on fronts. 9. All pieces feature hand-wrought metal bases and real iron metal band on top trim.